Croisière à six mains pour Anna Kirkpatrick, Anne Comode, Marcia Hadjimarkos, avec la complicité de Brigitte Chabard. According to the precept of cruises, Anna Kirkpatrick had the idea to unite different talents, to juxtapose places and multiply the means of showing off her astonishing and poetic armoires. City support was given by the museum, the curator of which, for a single time, revealed the secrets of a mysterious cabinet. * The “initiatic path” continued in the hallways of a sleeping palace where pilgrims eagerly flocked to discover a film of the two Annes: one films, the other wanders out from her studio to magical places in the city of Autun where she leaves her armoires behind. Stimulated by the unexpected confrontation with the ancient stones and windows enclosing Anna’s poetic world, the public leaves the screen for the stage. Marcia Hadjimarkos, a flower pinned in her hair, sits down at the piano. Unusual harmonies of twentieth century music resonate on the Viennese piano-forte brought from Cluny especially for the occasion. A tall evanescent silhouette, Anna opens--one by one--the doors of her armoires while Marcia turns the pages of her partition. Like a dream, a vessel created by Anna glides across the stage--slowly, very slowly, as if to delicately draw out the journey. Cruise with six hands: Anna Kirkpatrick, Anne Comode, Marcia Hadjimarkos with the collaboration of Brigitte Maurice-Chabard, curator Musée Rolin. The Chests grow taller to resemble columns from which secrets escape. 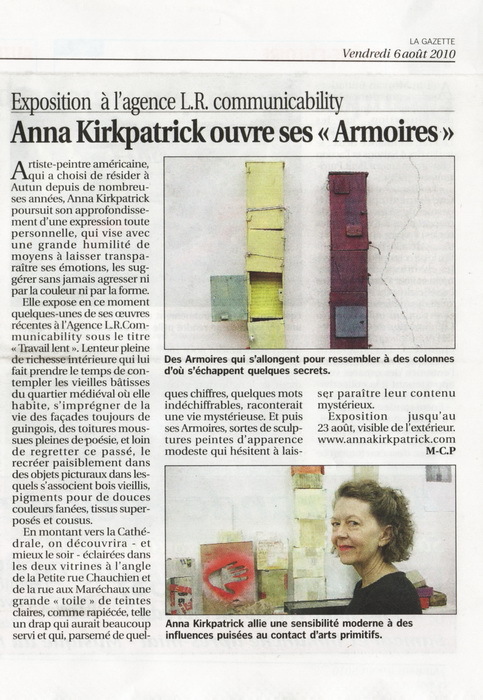 American painter Anna Kirkpatrick has chosen for many years now to reside in Autun. She pursues the deepening of an entirely personal expression that aims, with great humbleness of means, to reveal her emotions, to suggest them without ever being aggressive, neither with colour nor form. She currently exhibits recent work, under the title Slow Works, at LR Communicability. This slowness is full of an interior richness that grows out of taking time to contemplate the old buildings of the medieval quarter where she lives, steeped in the atmosphere of lopsided facades and poetic moss covered rooftops. Far from regretting the ancient past, she peacefully recreates it in pictorial objects that mingle worn, aged wood, pigments for faded gentle colours, and layered sewn cloth. Going uphill toward the Cathedral—and best in the evening--one discovers, illuminated in the two windows that form the angle of the petite rue Chauchien and rue Maréchaux, a large canvas of pale hues. Like a sheet, well-worn from use, mended, strewn with numbers and undecipherable words it recounts an enigmatic life. And the Armoires, painted sculptures of modest appearance, hesitate to reveal their mysterious contents. Exhibition until 23 August. Visible at night. Anna Kirkpatrick unites a modern sensibility with influences drawn from primitive art.